What is Arm Lift & Thigh Lift Surgery? 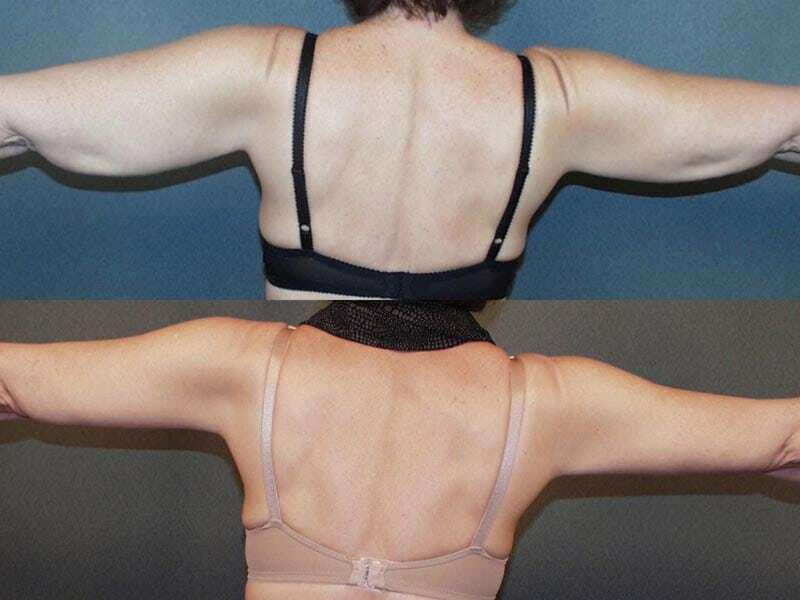 An arm lift is typically performed in conjunction with a body lift or thigh lift procedure for patients with an excess of loose skin accumulated, as a result of major weight loss. In addition, some people are genetically prone to having loose skin on the upper arms. As people age, skin laxity can become enough of a nuisance to require medical help. 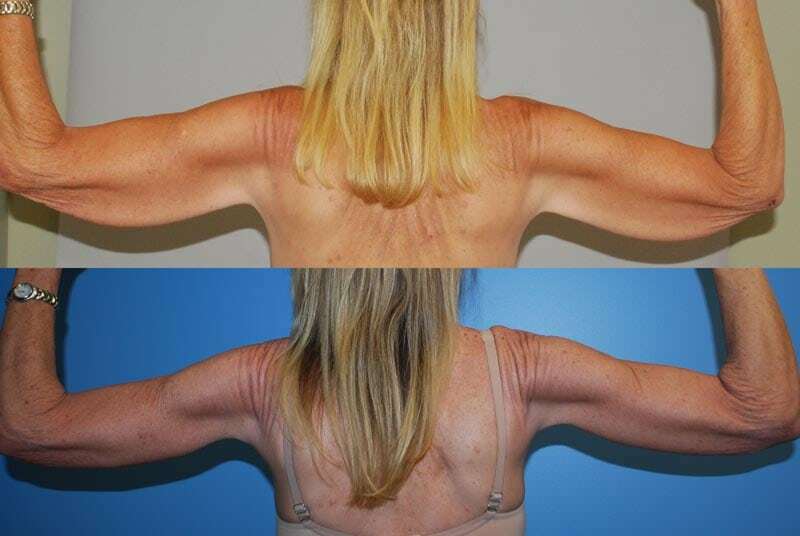 At Coastal Plastic Surgeons, we treat all of our arm lift patients with the utmost respect and dedication. We always endeavor to make sure the results are as aesthetically pleasing as possible. Our thigh lift procedure can be done on the inner or outer thigh area. Our body lift patients incorporate the outer thigh lift as it helps to enhance the overall procedure results. An arm lift procedure pairs well with thigh lift, inner or outer thigh, as it helps to contour and smooth out the surrounding area. Depending on how much weight has been lost, this thigh lift procedure is the best option. Also, for those who haven’t lost the weight but want to remove excess fat and skin, liposuction can be performed on the inner or outer thighs preceding the thigh lift procedure. If you are interested in getting an arm lift or thigh lift, please call (858) 365-3558 Coastal Plastic Surgeons and set up your complimentary consultation today. This is a 43-year-old female who underwent a gastric bypass procedure by Wittgrove Bariatric Center. She subsequently went on to lose 110 pounds. 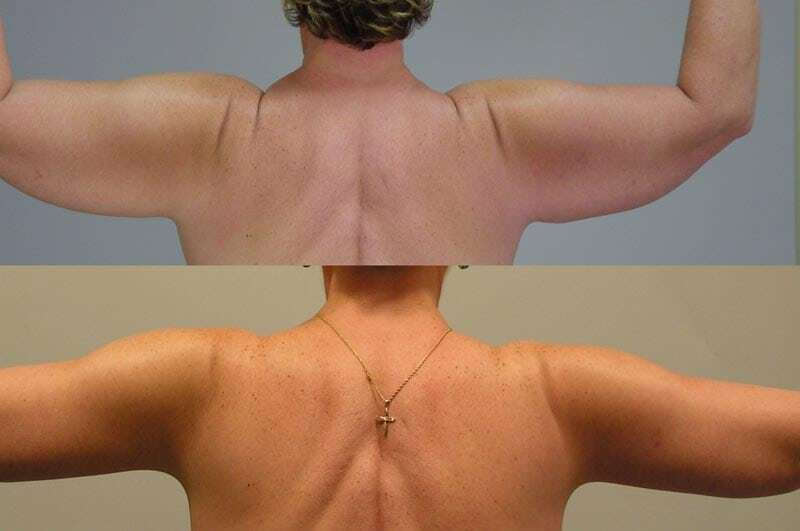 She then underwent breast augmentation and lift, as well as an arm lift. This photograph shows the posterior view of her arm lift. Overall, this patient s very happy with her outcome. This 54-year-old woman underwent gastric bypass performed at Pacific Bariatric, by Dr. Tanaka. She lives in Palm Desert, California, and during the summer months she experienced significant issues with regard to her hygiene and excessive sweating. She underwent a two-and-one-half-hour procedure including arm lift and removal of excess skin from her chest. This photograph was taken one year after the surgery and shows a very nice outcome. 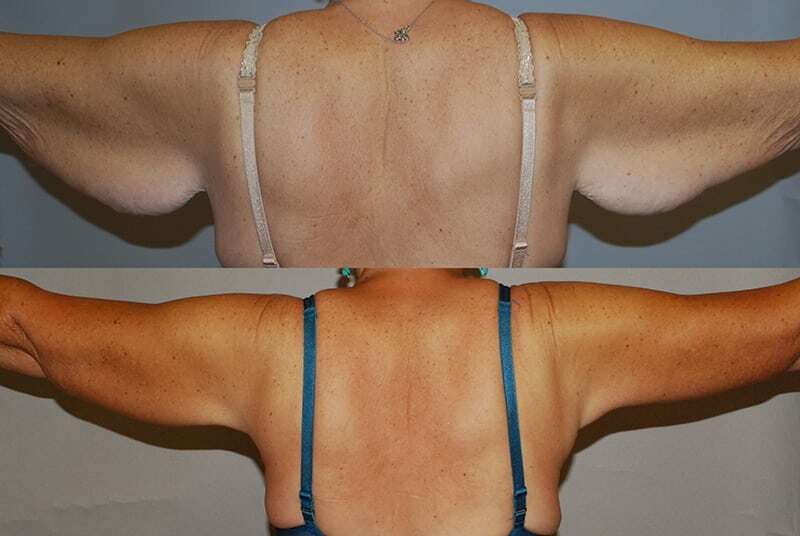 This patient underwent lap band placement performed by Dr. Bhoyrul and went on to lose 80 pounds. 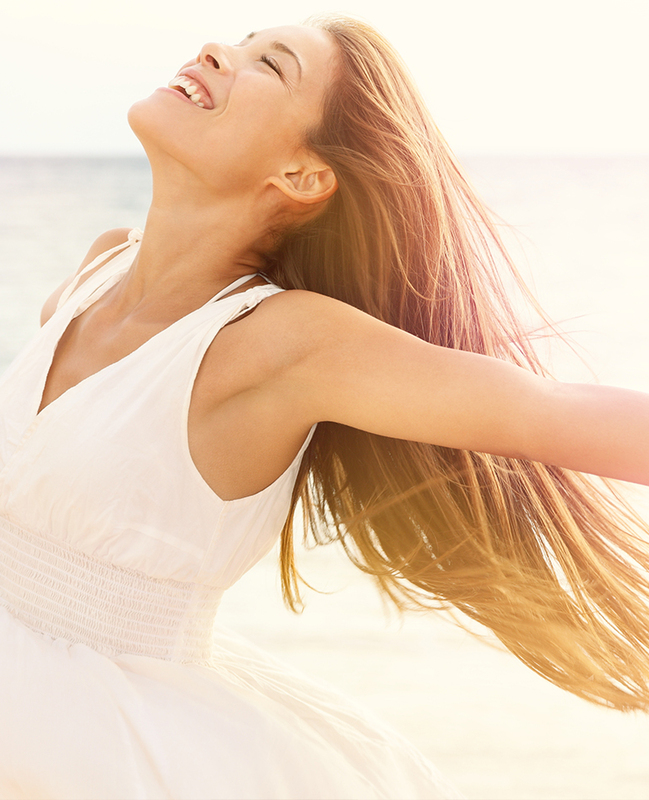 A breast augmentation and lift was performed, as well as a tummy tuck. Overall, this patient is very happy with her outcome. This photograph was taken approximately six months after surgery and shows a very nice result. This photograph was taken of the same patient in Case Study No. 1. As you can see in this view, the scars for her arm lift are very well hidden at the bottom portion of her extremity. The incisions from the breast lift and augmentation are still healing. Overall, this is a nice outcome. This patient underwent gastric bypass procedure by Dr. Callery and went on to lose 110 pounds. In this photograph you can see that the excess skin from her arms was removed. 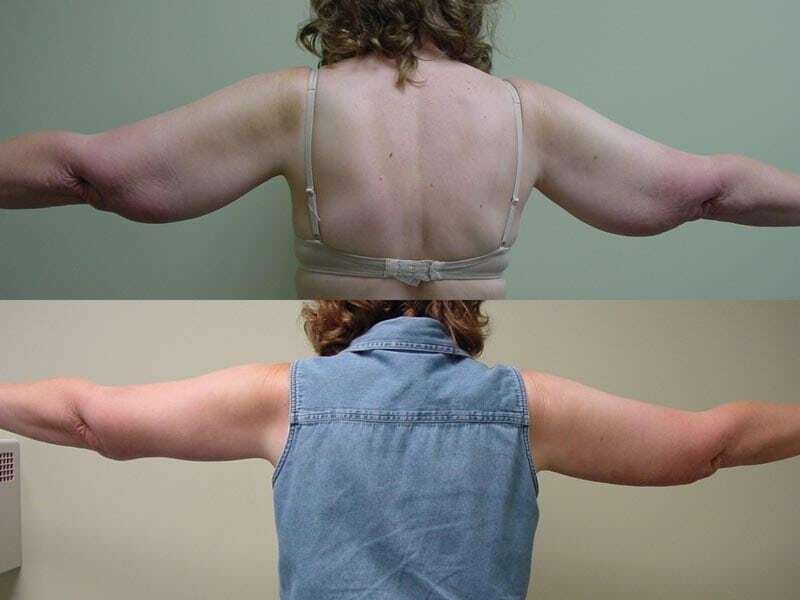 This patient expressed that she was happy to, “trade off” the extra skin from her arms for a small scar. This patient underwent gastric bypass procedure performed by Dr. Wittgrove. She came to me for an arm lift and breast lift with augmentation. 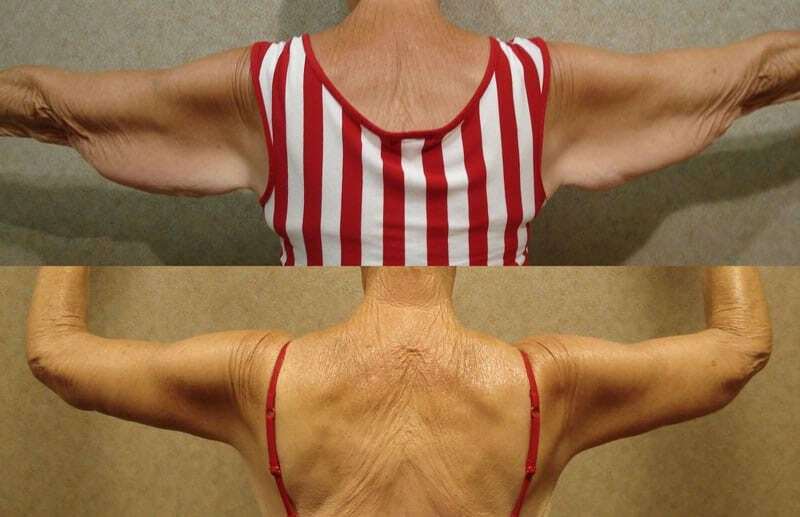 The extra skin was removed from her arms and as you can see in the post-operative photograph, she has a very nice result and she is happy with the outcome. 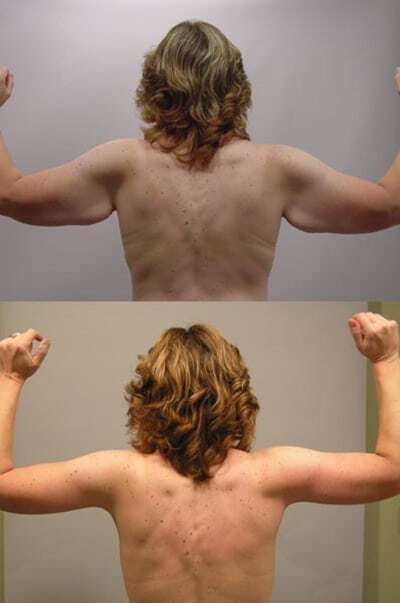 This patient lost approximately 40 pounds without surgical assistance. 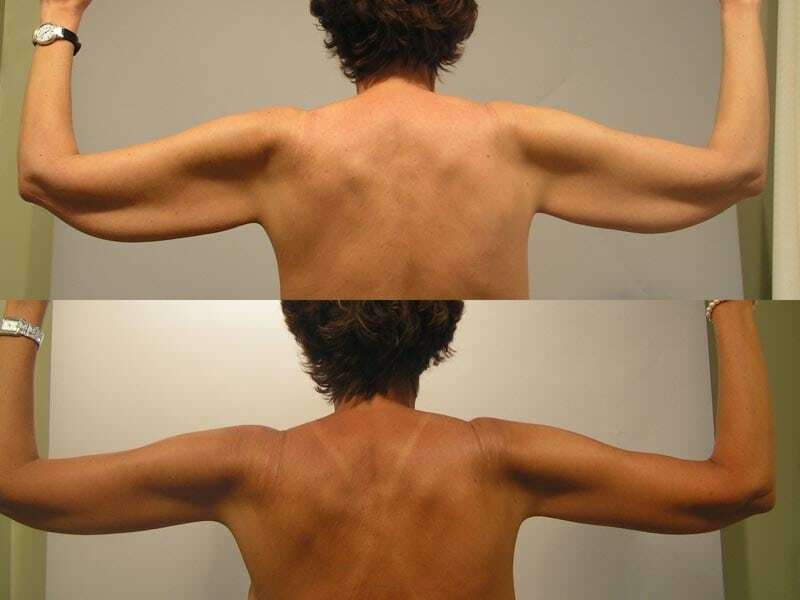 She was very unhappy with the loose skin of her upper arms and opted to undergo an arm lift. Overall, she is very happy with her outcome. This is a 38-year-old patient who lost 110 pounds after undergoing gastric bypass procedure performed by Dr. Wittgrove. She came to me for breast lift with augmentation, as well as an arm lift. 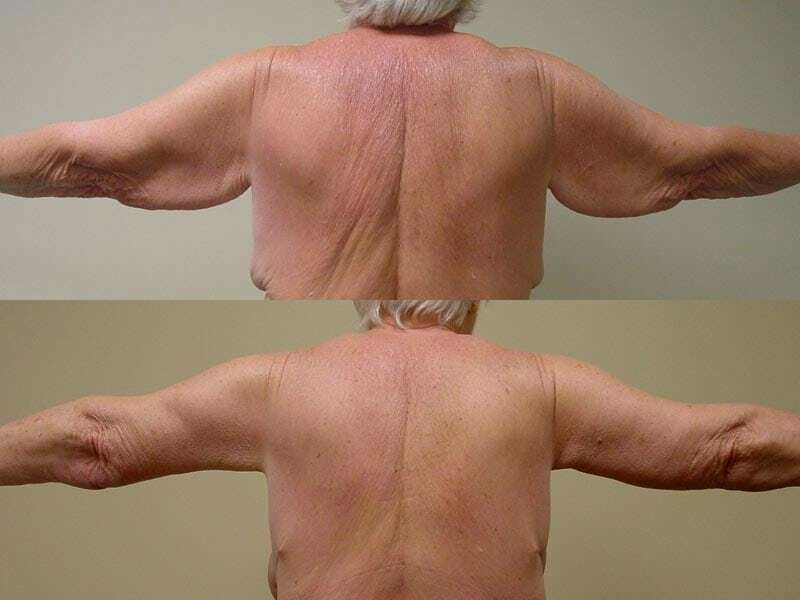 As you can see in the post-operative photograph, the extra skin from the inside of her upper arms has been removed with a very nice result. This is a 73-year-old female who underwent a gastric bypass procedure performed by Dr. Zorn. She presented to me for arm lift and breast lift with augmentation. Despite her age of 73, she was very physiologically healthy and underwent the two procedures without any complications. This post-operative photograph was taken six months after the procedures and shows a nice outcome. This patient lost 240 pounds following gastric bypass. She came to me for an arm lift and abdominoplasty. As you can see in the post-operative photograph, she still has a significant amount of extra tissue present after the arm lift. 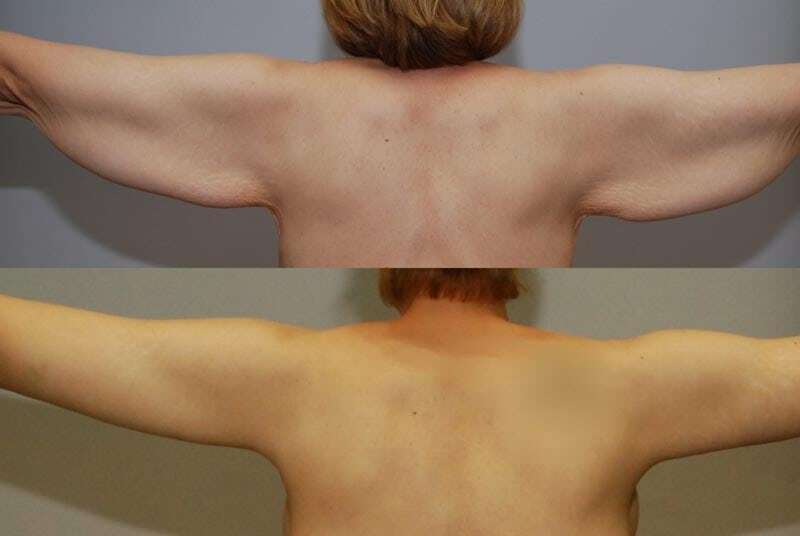 The reason for this is that despite performing a radical resection of the extra skin, there was no elasticity left in the tissue after such a massive weight loss. Therefore, at the time of surgery, all of the extra tissue was removed, but as you can see, approximately one year after surgery, there was recurrence. She is a candidate for removal of the additional tissue. 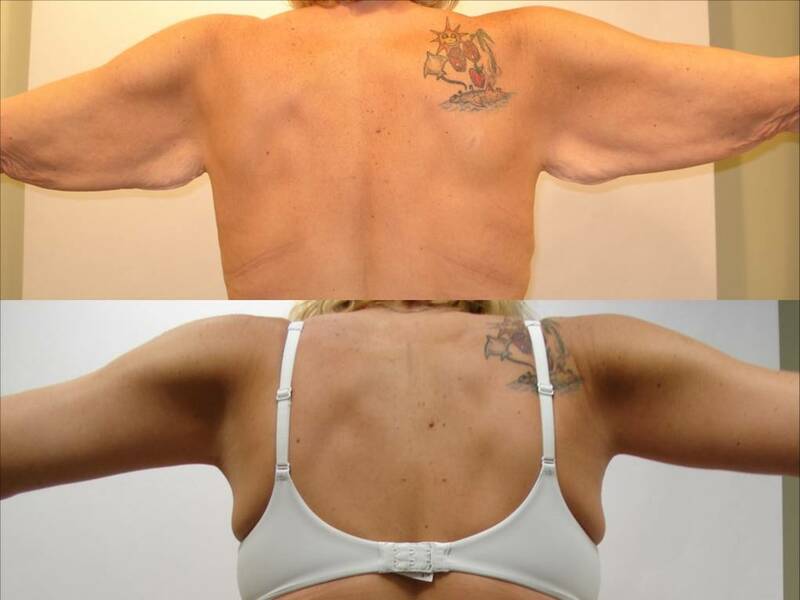 This patient lost approximately 30 pounds without surgery. She came to me for an arm lift. As you can see in the post-operative photograph, there is a very nice result. This patient is very happy with her outcome and is pleased to be able to wear more fitted sleeves. This patient lost 40 pounds without surgery. 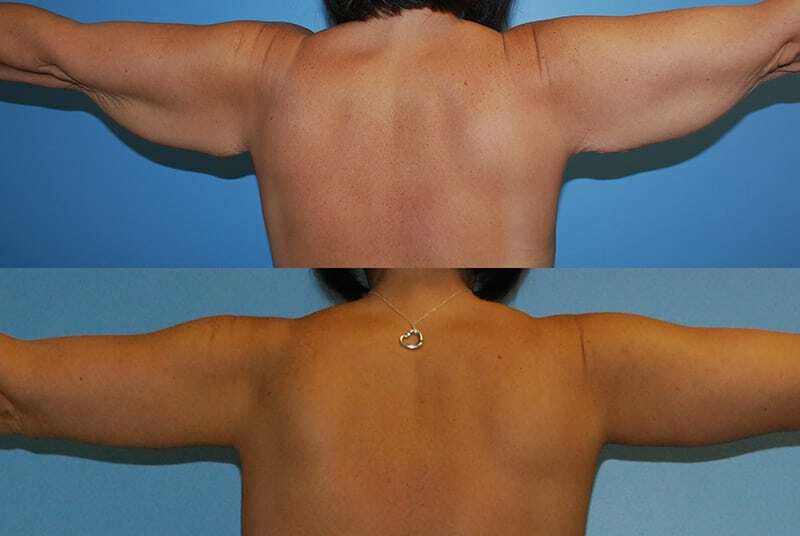 She underwent an arm lift and has had significant improvement in the appearance of her upper extremities. She is very happy with her result. This patient underwent an open gastric bypass procedure approximately ten years ago, performed by Dr. Tanaka at Pacific Bariatric. She presented to me for an abdominoplasty and medial thigh lift. As you can see in the post-operative photograph taken one year after the procedures, her scars have faded and there is tightening of the abdominal wall and thighs. This patient underwent gastric bypass procedure by Dr. Zorn with Pacific Bariatric. She came to me for a tummy tuck and thigh lift. 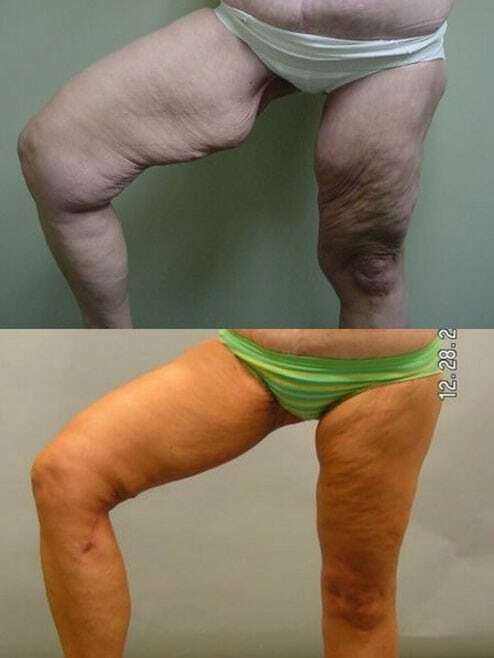 As you can see in the post-operative photograph, the vertical thigh lift scar goes down to the knee, but, overall, this patient is very happy with her result. Typically, thigh lifts are one of the more difficult operations to perform and can take up to six weeks to heal. This patient underwent a gastric bypass procedure by Dr. Rumsey at Pacific Bariatric. She went on to lose 110 pounds. She came to me for a thigh lift. Once again, the scar is worth the result. This patient is very happy with her outcome. Embrace dressing was utilized to minimize her scar. This patient lost approximately 80 pounds by dieting. We performed procedures for tightening of the abdominal wall and thighs. This post-operative photograph was taken one year after surgery. She is very happy with her outcome. This patient underwent a gastric bypass procedure by Dr. Bhoyrul. 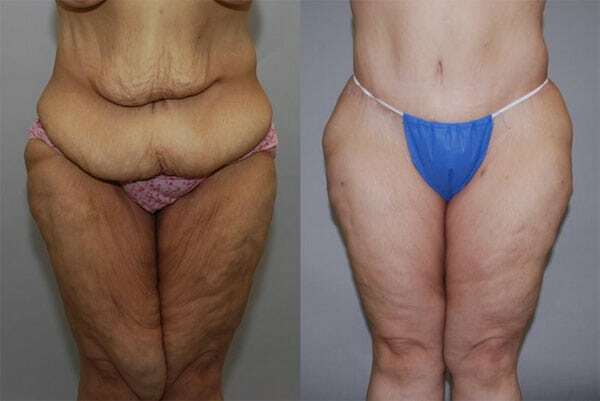 She came to me for an abdominoplasty and thigh lift. Overall, you can see that her contour is much better and she is very happy with her outcome. This patient lost 240 pounds after he underwent a gastric bypass performed by Dr. Zorn. He then came to me for a body lift and thigh lift. The result of the thigh lift shows the scars going from the groin all the way down to the knee. Overall, this patient is very happy with his outcome. Embrace dressing was utilized to minimize his scar.